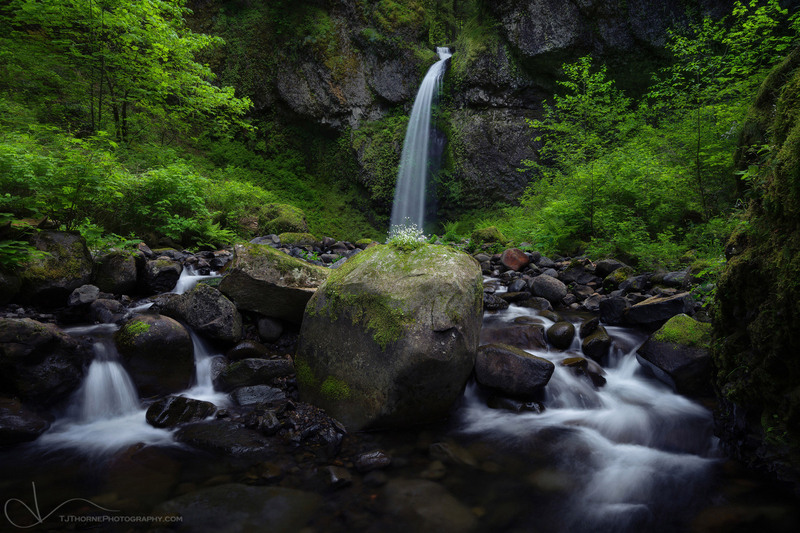 A large boulder diverts a stream into two sections below a hidden waterfall deep in the Columbia River Gorge, Oregon. I often find metaphors for my life in my photos. If you follow my work and read the accompanying pieces you may have noticed that for the past couple of years I’ve been going through a lot of transition. A lot of it is voluntary, and obviously, some of it is not. Often times I reach a fork in the road and I make the best decision I can in that moment. Most of the times the decision is based on emotion and intuition over practicality and facts but it’s still a decision that I believe will push me closer to my goals. As I near my goal, or maybe it’s just that I’m getting farther away from where I started, things become more and more apparent. The hills I’ve climbed and the valleys I’ve fallen into create such an extreme between the beginning and the end. Desires strengthen while frustrations build and being torn between dreams and practicality can make life pretty challenging. Those challenges create desperation and a willingness to make compromises that maybe I wouldn’t make otherwise so that I can continue to march towards my goal. Things that weigh me down are more easily set aside. Things that lift me up become stepping stones through those challenging times. It’s certainly a rollercoaster of emotion that impacts me in a lot of ways.. creative energy being one of them. I am held back in my art, still tethered to the beginning of the journey by practicality and the comfort in knowing what IS. It’s nearing the point where I need to make some major decisions. Which path do I follow? The path of uncertainty? I’ve never been good with uncertainty. Or do I follow the path that I know? There’s no doubt that both paths will have their challenges, will intersect at times, and each have their own peaks and valleys. But I know for certain that one of them has better views at the end. I just have to decide what I’m willing to give up to see it.